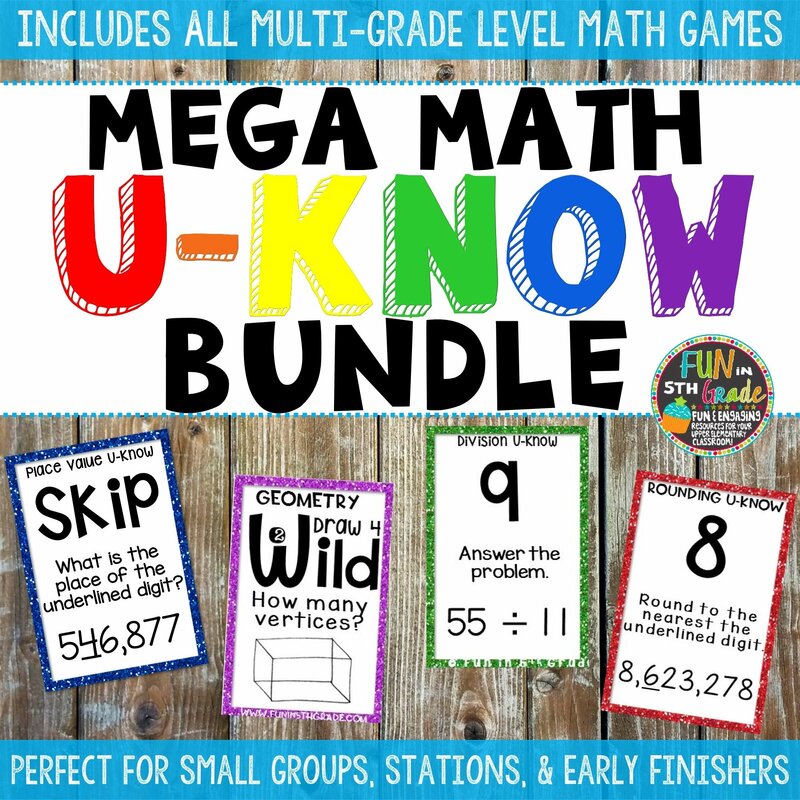 If you teach math to grades 3-6 and your students LOVE games then this U-Know bundle is for you! Kids loving practicing their math skills when they get to play U-Know! Math games are the perfect way to review math topics such as Telling Time, Place Value, Fractions, Measurement, Geometry, Rounding, Multiplication, and MORE! Include 14 total math games! Let them practice with these fun and engaging math games that will make the skills something students WANT to do! Works great for math centers, early finishers, or small group. Students will be begging to practice math topics with these games! I’ve had many students ask to play at recess and even lunch! ★Please note: This bundle includes all of my math U-Know games that are not grade level specific. Grade level specific bundles must be purchased separately from this bundle. Please ask any and all questions before purchase. If at any time I add multi-grade level math games to my store, they will be added to this bundle. Teachers who do centers, stations, or small groups in the classroom. Teachers who are looking for a consistent game to use in math class for students to review. Teach the game once and use them all year! Which games are included in this bundle? What do you get in each set? U-Know is a fun and engaging card game where students practice topics in a repetitive way. I also use U-Know in math stations throughout the year to spiral concepts for students. U-Know comes in MANY topics! So, once students learn the game, it will become a self-run station! "What is better than when you find an activity that your students want to play over recess! Thank you so much!!" "I am so excited for these! My kids loved the freebie Subtraction U-Know, they will be excited for more games to play!" "I purchased the place value version at the beginning of last school year, and my students BEGGED to play it all of the time. I am excited to be able to use the other versions this year." "A great game for review, centers, or small group practice. The printing lines up beautifully and the game is very well done. So glad I went with the bundle!"